Not to be confused with Three halfpence (English coin). The British three halfpence was a silver coin worth 1 1/2d or 1/160 of a pound produced for circulation in the British colonies, mainly in Ceylon and the West Indies in each year between 1834 and 1843, and also in 1860 and 1862. Proof coins were also produced in 1870. The coin is considered to be part of the British coinage because it has no indication of what country it was minted for, being made in the same style as the other contemporary coins of the United Kingdom of Great Britain and Ireland. The coins were made of silver, weighed 0.7 grams and had a diameter of 12 millimetres. The reverse of the coin, throughout its existence, showed "1 1/2" beneath a crown and over the date, all contained within a wreath. 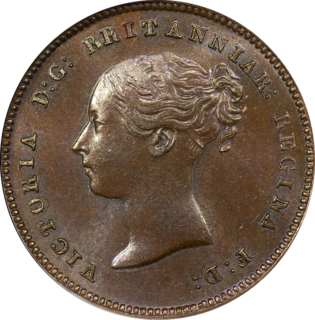 The obverse of coins minted between 1834 and 1837 show the right-facing portrait of King William IV with the inscription GULIELMUS IIII D G BRITANNIAR REX F D. The obverse of the later coins bear the left-facing portrait of Queen Victoria, with the inscription VICTORIA D G BRITANNIAR REGINA F D.
For other denominations, see British coinage. The silver three-farthing coin was introduced in Queen Elizabeth I's third and fourth coinages (1561-1582), as part of a plan to produce large quantities of coins of varying denominations and high metal content. The English three halfpence, a silver coin worth ​1 1⁄2d, was introduced in Elizabeth I of England's third and fourth coinages (1561–1582) as part of a plan to produce large quantities of coins of varying denominations and high silver content. The obverse shows a left-facing bust of the queen, with a rose behind her, with the legend E D G ROSA SINE SPINA – Elizabeth by the grace of God a rose without a thorn – while the reverse shows the royal arms with the date above the arms and a mintmark at the beginning of the legend CIVITAS LONDON – City of London, the Tower Mint.